Have you heard of diaper cakes? In our area, diaper cakes are not that famous but I have seen these before and I so love the idea of having diaper cakes during baby showers. The good thing about diaper cakes is that everything in it can be used by the baby. It is made from diapers, stuffed toys, bibs and other baby stuffs. Other decorations can also be added like ribbons. 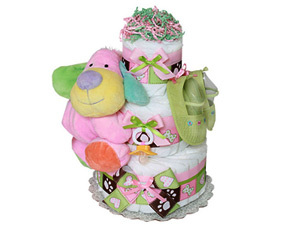 Diaper cakes are made as centerpiece and gifts for baby showers. It is one great way to come up with a complete gift for a mommy-to-be! You can actually create your own diaper cake. Just be creative with the available items you have. If you are planning to create your own diaper cake, I have collected some designs for your inspiration. Or you can also get them from the sources which I have indicated below the picture. Aren't these diaper cakes cute? For sure, your baby shower will be complete if you have this. You can create one for your own party or you can also make a gift for your friend who is having a baby shower. The ideas you see above will surely fuel your creativity! Good day! This is my first comment here so I just wanted to give a quick shout out and say I truly enjoy reading your articles. Can you suggest any other blogs/websites/forums that go over the same subjects? Appreciate it! These are amazing! I've been looking for a creative way to incorporate all the baby diapers my sister is inevitably going to receive into some kind of decoration for her baby shower- perfect! Thanks for checking this Jess! Hope you'll get inspiration from these diaper cakes. I made a good diaper cake from Jessica Alba Diapers and take lots of pictures. It is not as tough as I thought it was. Very adorably cakes. Thanks for sharing the baby shower cakes. Wow diaper cakes sure have come a long way since I first saw them a few years ago. At my cousins baby shower a few weeks ago my Aunt got pretty fancy with it and made it into a carousel using small stuffed horse animals, toddler feeding spoons, ribbon, etc.